I am thrilled to share a secret I've been keeping for a few weeks! 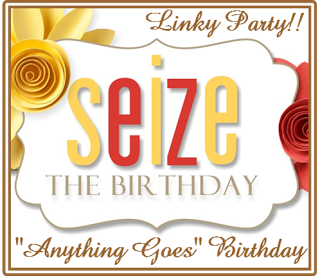 I've joined the Design Team at the Seize the Birthday challenge blog! It was such a surprise (and an honor) to receive an email from Nancy and Lesley inviting me to join this amazingly-talented team. My first post with STB will be on January 16th. Tomorrow!!! Each challenge runs for 2 weeks, so there is plenty of time to play along. Wait til you see the fun challenges ahead for us! I hope you'll join in the fun! So happy to be part of a team with you again Susie!! Big congratulations, Susie! I'm sure you will do a great job! Woohooo...hugs congrats to you Susie! You will be a fabulous asset to the team!